Who are the people behind the urban farming projects cropping up all over the Puget Sound Region? What inspires them? What foods nurture them? Urban Farm Hub has launched a weekly spotlight series to celebrate the amazing people who spend their days creating a healthier, more sustainable local food system. This week we’d like to celebrate the community-oriented work of Sandy Pernitz. In addition to being a lover of garlic and anything fresh, Pernitz has been working with the City of Seattle Department of Neighborhoods P-Patch Community gardening program for the last 15 years. 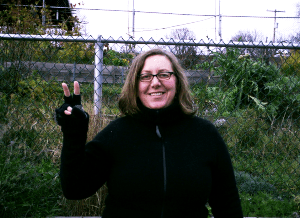 The first five years was spent as a volunteer working to build a community garden in her downtown Seattle neighborhood. The past ten years she’s been a staff person for the P-Patch Community Gardening program as a Community Garden Coordinator. Community Garden Coordinators work with communities to design, build and maintain the city’s public community garden spaces. Pernitz has also spent the past 20+ years working on all sorts of environmental ’seeding’ projects; planting sustainable strategies at the community level through better design and philosophical practices–always emphasizing the connection between this work and peoples’ real lives. Community gardening, Pernitz feels, can bring all of these elements together in a tangible way. People can build a greater connection to nature through growing their own food. What inspired you to get involved in the local food movement? I have to admit, I am not a foodie and my path here was one more about community and the love of the environment. Having said that, my involvement with the P-Patch Program exposed me to the local food movement and the wonderful possibility of growing my own food, along with the great satisfaction and joy that brings. It brought me back to being a kid and wanting to grow food in our yard and not being able to because we lived in a very wooded area. Community gardens are a great way for people to have access to both. If you could change only one thing about our local food system, what would it be? That we all had a greater recognition for and felt that we were part of the greater environment. Food is part of that splendid connection to the environment; one does not trump the other, they are all intertwined. If you could bring only one pack of seeds on a long trip what kind would you bring? Well I love garlic–can it be a few bulbs instead of seeds? Garlic is easy to grow. I guess I am more like the first farmers that liked to “garden” in a messier, more natural way. I’m not a big fan of keeping neat and tidy rows. What do you think about the adage “It’s not the food we eat; it’s our eating habits”? I don’t see the difference here at all. Aren’t eating habits directly reflective of the food we eat? If we just stop all the heavy food processing, we wouldn’t lose all of the wonderful energy and nourishment that comes from plants and whole foods. Speaking of eating habits, what’s your vision of the perfect meal? Fresh. Fresh. Fresh. I have quite a few food allergies–probably from bad eating habits over the years–so the perfect meal for me is a seasoned soup with fresh veggies. I love nothing more then a wonderful broth cooked down over time to pull those spice and herb flavors out. I then like to add fresh veggies to the broth and potentially some meat, which I also love. If you were a goat, what would you say? I think I am a goat, at least that is what my husband tells me since I am always grazing on green items outside. Yes, I will try anything green! So I guess I would say, thanks for all the great things to eat.